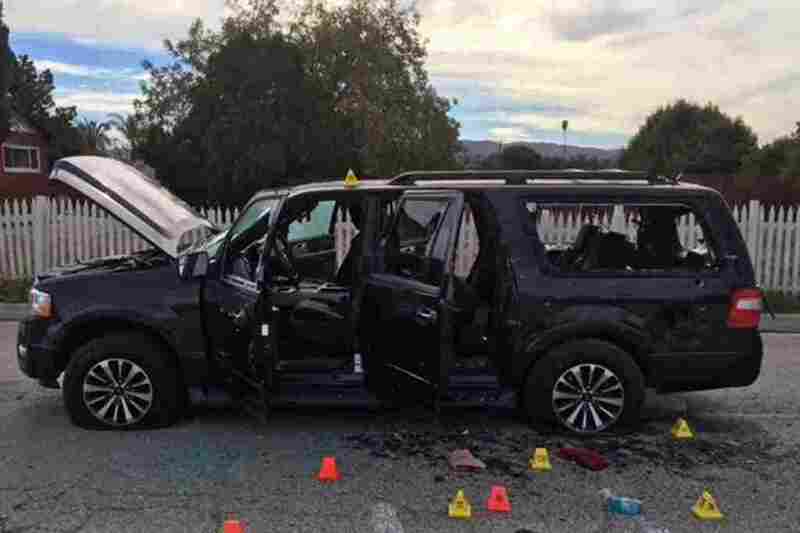 San Bernardino Shootings: What We Know, One Day After : The Two-Way Police said they discovered a stockpile of ammunition and explosives inside a house connected to the suspects, husband and wife Syed Farook and Tashfeen Malik, who were killed in a shootout Wednesday. After a mass shooting, a police chase and a shootout, a violent day in San Bernardino, Calif., ended in the death of two suspects, authorities say. 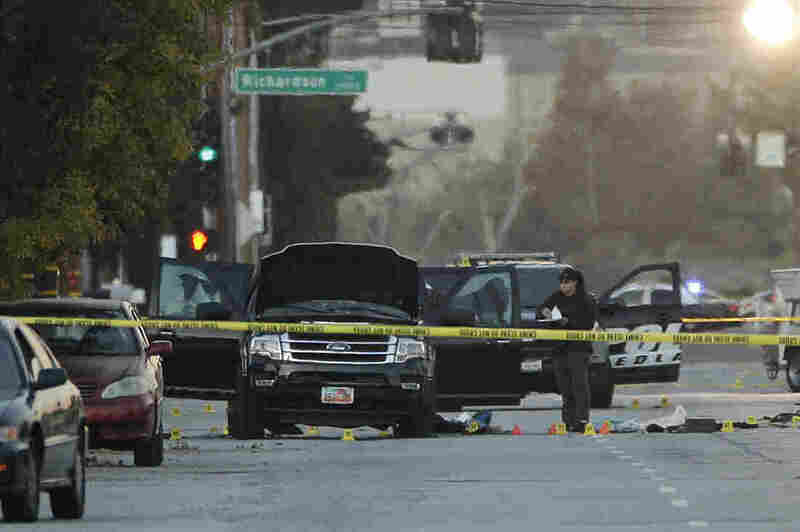 Syed Farook, 28, and Tashfeen Malik, 27, were responsible for the Wednesday morning attack that killed at least 14 people and injured 21, according to San Bernardino Police Chief Jarrod Burguan. After initial concerns that there could have been a third shooter, police are now confident there were only two. Thursday evening, authorities released the names of the 14 victims. PHOTOS: Scenes From San Bernardino, Calif. This undated photo provided by the California Department of Motor Vehicles shows Syed Rizwan Farook, who has been named as a shooting suspect in the San Bernardino shootings. Syed Rizwan Farook, an environmental specialist who was born in the U.S., had worked for the San Bernardino County health department for five years. Tashfeen Malik, Farook's wife, was in the U.S. on a K-1 visa and had a Pakistani passport, according to David Bowdich of the FBI's LA office. The couple had been married for about two years, says Hussam Ayloush of the Council on American-Islamic Relations. They had a 6-month-old daughter, whom they left with Farook's mother on the morning of the attack, Ayloush says. Ayloush notes that Farook and Malik were both Muslims and their families said they showed no sign of fanaticism. He emphasizes that the attackers' motives remain unknown. Neither had a criminal record that police are aware of, Burguan says. Patrick Baccari worked with Syed Rizwan Farook for two years. He told NPR's Kelly McEvers that though Farook was quiet, he "assumed Syed was our friend." Baccari was in the bathroom when the shooting began. "As I'm pulling the paper towels from the dispenser there's explosions, there's bullets flying through the walls. I look at myself in the mirror and see the blood. I thought somebody booby-trapped the towels dispenser," Baccari said. He and three others stayed in the restroom until officers arrived. 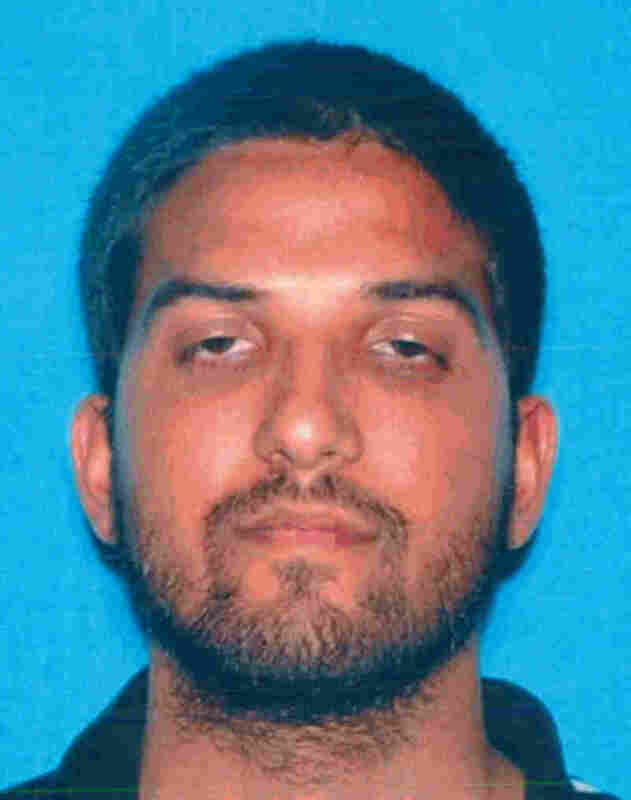 Farook's brother, Syed Raheel Farook, served in the Navy from 2003 to 2007, a Navy spokeswoman confirmed to NPR. Syed Raheel Farook completed his service as an information systems technician 3rd class, a junior enlisted sailor, and he was attached to the crew of the aircraft carrier USS Enterprise. Navy records indicate that he made at least one deployment aboard the Enterprise to the Middle East. 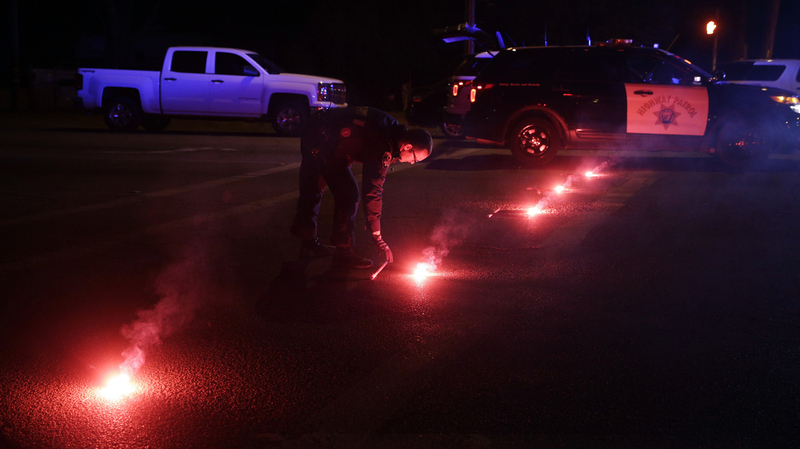 A police officer lights up flares near the scene of a shootout in San Bernardino, Calif., on Wednesday. Police say Syed Farook, 28, and Tashfeen Malik, 27, opened fire on an office holiday party in the Inland Regional Center. The attack began on Wednesday morning, at an office holiday party in the Inland Regional Center in San Bernardino. The center provides social services to residents with developmental disabilities, but the shooting was focused on an office party for San Bernardino County staff. Burguan at a press conference late Thursday that 75 to 80 people were in the room. As a county employee, Farook was at the party. At some point he left in anger, Burguan says. Both were dressed in "tactical gear" (including load-bearing vests, but not ballistic or bulletproof vests) and carrying .223-caliber assault-style rifles and semiautomatic handguns, police say. The weapons used in the shooting were legally purchased, Burguan says: The handguns were purchased by Farook, and authorities are still investigating who purchased the rifles. 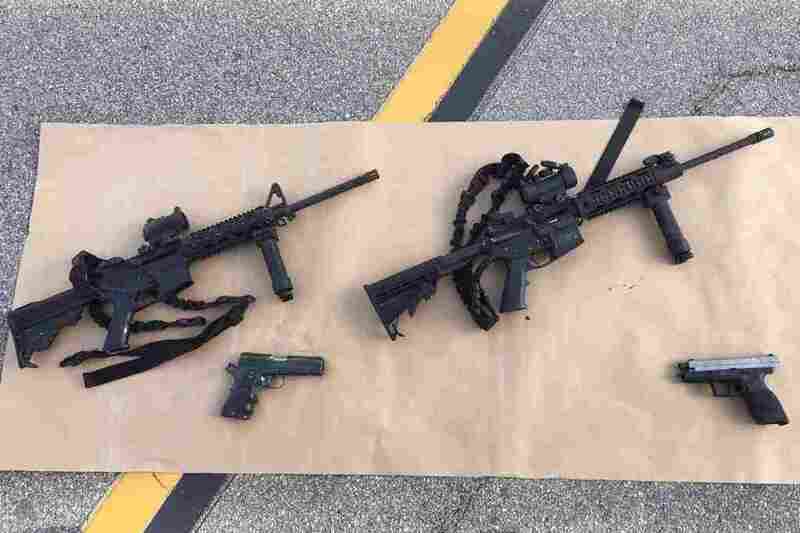 Farook and Malik entered the Inland Regional Center and fired between 65 and 75 rifle rounds, Burguan said Thursday. 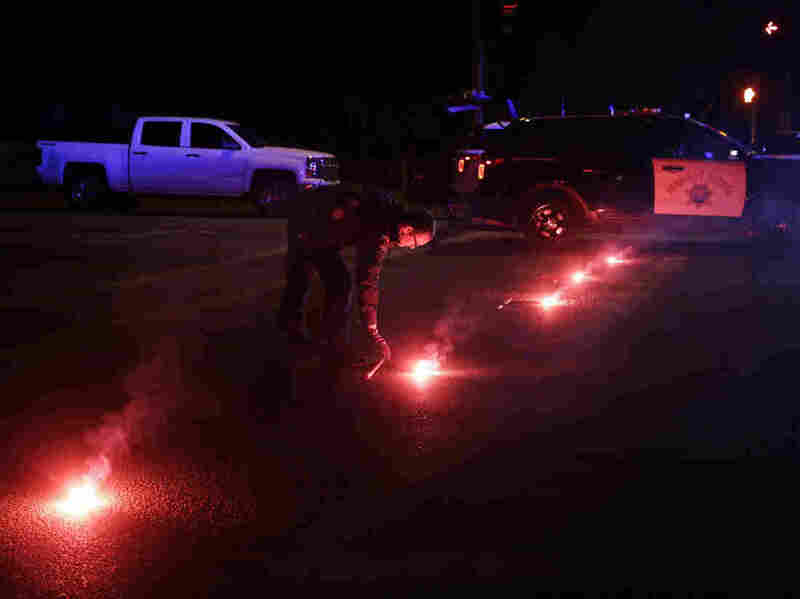 A bomb — three explosive devices, linked to a remote control car and placed inside a bag — was also discovered at the shooting site, but it failed to go off, Burguan said. At least 14 people died and 21 were wounded in the initial attack. Emergency response teams rushed to the facility. Approximately 300 officers were part of that response, Burguan said. But Farook and Malik were able to escape. As the search for the suspects began, hundreds of people were evacuated from the Inland Regional Center. Farook was wearing a ski mask at the time of the shooting, law enforcement officials tell NPR's Dina Temple-Raston, but witnesses to the shooting still recognized him. Police can't confirm whether Farook and Malik lived in the house. At the house, police encountered Farook and Malik, driving a black Ford SUV. The car was a rental, the police said Thursday. Farook and Malik drove off in the SUV, and police pursued. The car chase ended in a shootout. Law enforcement officers fired approximately 380 rounds at the car; the suspects fired around 76 rounds at the officers. The suspects had over 1,400 .223-caliber rounds either on their person or in their vehicle, Buergan says, and over 200 9-mm rounds. Hours after the attack began, the two suspects were dead. Two officers suffered injuries that are not life-threatening. A third person was taken in custody; police have determined he was not involved in the shooting and is not a suspect. 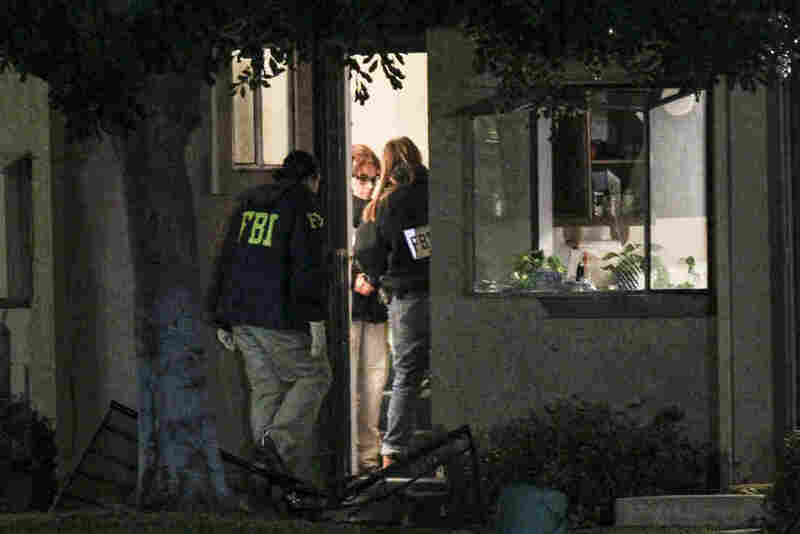 FBI agents search Thursday outside a home in Redlands, Calif., in connection with the San Bernardino shootings. The FBI is leading an investigation into the attackers' motives and planning. An armored vehicle with a battering ram attached "very slowly and methodically" broke down the door of the house in Redlands on Wednesday night, a witness told the LA Times. Police discovered a stockpile of ammunition and explosives inside the house, Burguan said Thursday, including thousands of rifle and handgun rounds and 12 pipe bombs, with the materials and tools to create more. Investigators also removed thumb drives, cellphones and other electronic items from the house, Burguan said. Authorities also continue to examine the site of the shooting at Inland Regional Center and the site of the shootout at the SUV. All of the agencies involved in the investigation emphasize that they have not identified a motive for the shooting. The FBI has tasked counterterrorism agents to the case, NPR's Carrie Johnson reports, but has not yet determined whether the attack was in fact an act of terrorism. Carrie also says a source tells her Farook had some electronic contact with people overseas who were on the radar of U.S. national security officials, but that investigators are still trying to work out the significance of that contact. Whatever the motive, Burguan, the San Bernardino police chief, says there does appear to have been some form of planning involved in the attack. "I don't think they just ran home, put on these types of tactical clothes, grabbed guns and came back on a spur-of-the-moment thing," he said Wednesday. President Obama made a statement from the Oval Office on Thursday, noting that it "may take some time" for investigators to conduct interviews and sort through the evidence. He again emphasized that the motive is not yet clear, and said investigators have not ruled out terrorism, a workplace-related shooting or a mixed-motive attack. "Rest assured that we will get to the bottom of this," he said. 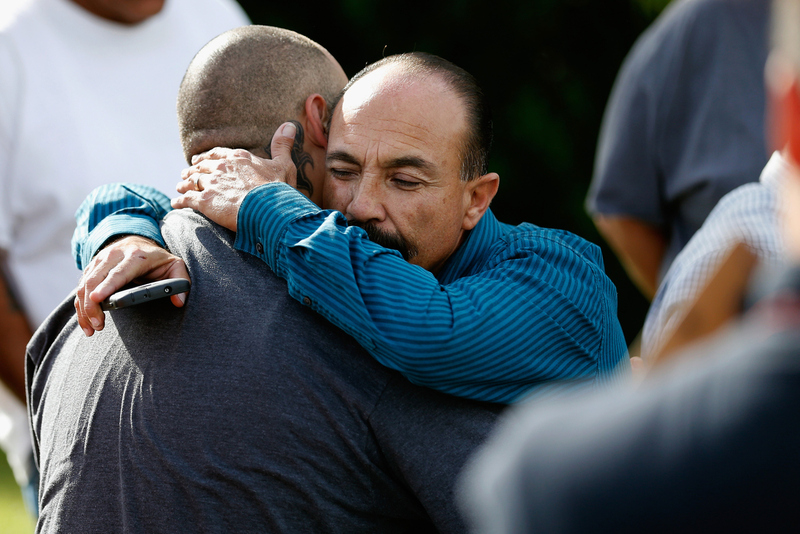 Jesus Gonzalez (left) and Pastor Ernie Ceballos (right) hug outside the crime scene where the suspects of the Inland Resource Center were killed on Wednesday in San Bernardino, Calif.
San Bernardino Mayor Carey Davis said in a statement that the attack "has shaken the core of our community." The county suspended all nonessential county services for Thursday and Friday. Late Wednesday, Farook's brother-in-law, Farhan Khan, appeared at a press conference with the Council on American-Islamic Relations (CAIR) for Greater LA and said he had no idea why Farook would carry out such an attack. "I just cannot express how sad I am for what happened today," he said. He wished victims a speedy recovery and said he was in shock over the shooting, according to member station KPCC. "We unequivocally condemn the horrific act that happened today," Ayloush, the executive director of the LA CAIR office, said at the same conference, speaking on behalf of the local Muslim community. "We offer our heartfelt prayers and condolences to the injured, to the families of those who have been killed. ... We stand in mourning, in sadness, for what happened." 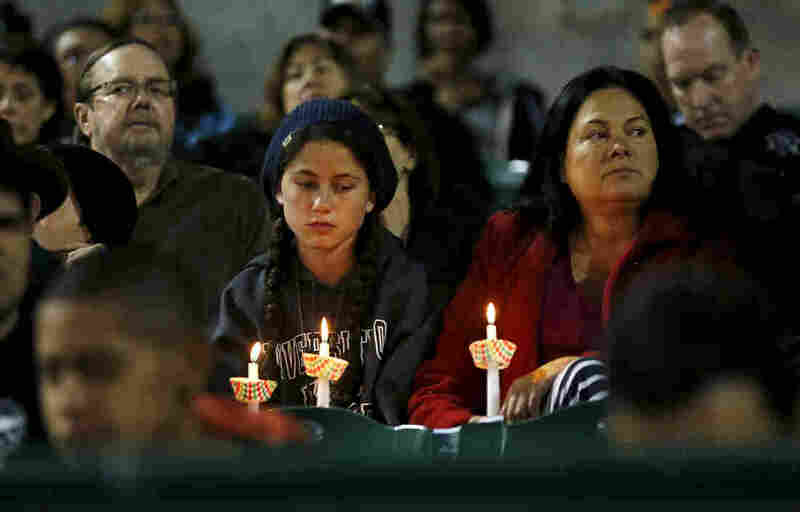 Attendees reflect on the tragedy of Wednesday's shooting attack during a candlelight vigil in San Bernardino on Thursday. President Obama, in an interview on CBS on Wednesday night, called for changes to America's gun control laws, as he has after mass shootings at Newtown, Conn.; Tucson, Ariz.; Fort Hood, Texas; Charleston, S.C.; and Colorado Springs, Colo., among others. On Thursday, he reiterated his calls to make it harder for people to acquire weapons. And in a press conference Thursday morning, U.S. Attorney General Loretta Lynch said violence like the San Bernardino shooting "has no place in this country." "This is not what we stand for," she said. "This is not what we live for."